Book your Chiropractic, Massage, Orthotics, Laser or Shockwave therapy session now. Dr. Tyler Hunsberger and Dr. Jerry Wright have their multi-disciplinary Chiropractic clinic located at two major crossroads in beautiful Kitsilano. These Vancouver Chiropractors offer Chiropractic care, custom orthotics, Active Release Technique (ART), Shockwave Therapy, and Registered Massage Therapy. Broadway at Burrard Chiropractic is also one of the few clinics offering Laser Therapy in Vancouver. Chiropractic is a natural, safe and efficient treatment for many common ailments such as back pain, neck pain, and headaches. Whether you are looking for pain relief from an acute injury or preventative wellness care to achieve your best possible health, chiropractic is an excellent choice. Your feet are considered your base of support and have a direct impact on the rest of your body. Problems in your feet can cause a chain reaction of events to occur, and put stress on joints higher up in your body. This stress can lead to joint pain, poor posture, fatigue, and faulty walking mechanics. Broadway at Burrard Chiropractic is one of the few clinics that offer Shockwave therapy. Shockwave therapy treatment is effective non-surgical treatment for relieving pain from a variety of conditions. 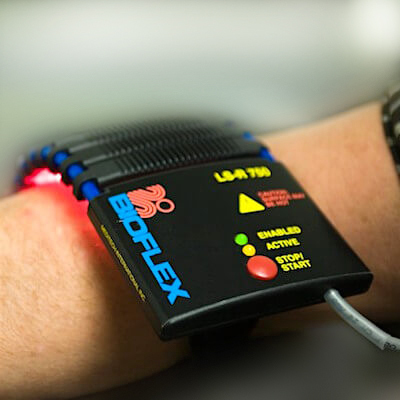 Throughout the world, laser therapy has proven to be a safe and non-invasive modality for accelerated pain relief and tissue healing. It is used to maintain wellness, improve health, and optimize athletic performance. Over 4000 studies have been conducted to validate the effectiveness of this technology. As a professional triathlete training over 25 hours a week, it is imperative that my body recovers from the load, reduces the chance of injury and most importantly, maintains excellent alignment. Since Tyler practices both Active Release Therapy (ART) and manipulation therapy, I am able to work closely with him on maintaining healthy muscles and a healthy spine. My "problem" areas are the pelvic and SI joint regions, which can cause symptoms to extend down the leg as well as up to the neck. Tyler works both modalities (ART and Adjustments) to ensure maximum muscular relief and optimal alignment. It is due to his thorough assessment and attentiveness to perfect alignment that I have been able to continue to train as much as I do. ART is one of the most effective therapies for treating chronic or acute muscle imbalances and Tyler is the finest practitioner I have work with in my ten year athletic career as an amateur and elite level athlete." Dr. Jerry Wright sets the standard for not only chiropractic care, but health care. His breadth of expertise reaches far beyond that of spinal health. Jerry's years of excellence in healthcare places him in a field all his own. With any health concern, Dr. Jerry Wright is the foremost individual to consult. His ability to diagnose a multitude of conditions not only gives credit to chiropractic medicine but medical health in general! Just this morning I met a stranger at a bus stop who was complaining about her sore back. I told her, much the way I've told at least hundreds by now, that she should see you. I said, "If anyone can get you better, it's Dr. Hunsberger." You are the first person I think to see whenever I've hurt myself or when an existing condition flares up. You have taken care of so many of my friends and colleagues, have never failed to give us relief from pain with your extremely effective, efficient and gentle treatments. Equally important, you have always given us clear explanations of what went wrong and careful instructions about how to take care of ourselves at home to promote healing and to prevent further injury. You are an amazing community resource - a real treasure! I know I speak for many others when I say I hope you stay in practice a long, long time. I feel Dr. Wright has a special gift for healing. As a trainer, I refer all my clients in need to Dr. Wright. We have been working together for five years, and I know that all of his patients are in good hands. I see Dr. Wright for my own chiropractic needs and am thrilled with the results I achieve with his expertise. After six years of struggling with injuries and lasting pain from a car accident, I finally found Broadway and Burrard Chiropractic! I have tried countless treatment regimens and the level of care, support and service I receive here is superior to anywhere else. With Chiropractic adjustments, laser, orthotics and massage, I am taken care of no matter what symptoms I am experiencing. I have finally had success in my recovery and I could not got here without Jerry and Mel. I started seeing Dr. Tyler Hunsberger personally for A.R.T. and adjustments a couple of years ago. Having seen many practitioners over the years I was able to discern that Dr. Hunsberger is extremely effective. His calm comforting demeanour, passion for his work, alongside awesome treatment and education is a powerful combination. This is exactly the synergy that I feel works well for "healing". As a full-time coach I seek to find practitioners in various specialties that I feel confident referring my athletes to. Tyler has helped many of my athletes over the last 18 months. I will certainly continue to work with him both personally and professionally. I was trying to manage my sciatic pain for over a year. Suddenly, it ballooned out of control and I needed help. Physio, massage, and acupuncture therapy did little. I couldn’t walk, stand or sit without experiencing extreme pain. I literally felt hopeless. Dr. Hunsberger and his staff at Broadway @ Burrard Chiropractic, changed all of this! Using a unique blend of chiropractic adjustments and low-intensity laser therapy, Dr. Hunsberger took me back from the brink and changed my life! But what’s most amazing is his commitment to care and complete recovery. He really, truly cares about you and take the time to get the results needed. When I first limped into his office, he said the words, “I want to be the one to make you better.” Well, he certainly did and I believe he can help make the difference in your life too! Dr. Jerry Wright is a vital team member of the film industry in Vancouver. He has been treating my actors, crew and myself for numerous years. His experienced and ever-friendly, humorous manner helps give us the added chiropractic support necessary for our high-stress industry.